Chinese songs can be an amazing tool for Mandarin learners. … they can provide an enjoyable way to immerse yourself in Chinese culture and boost your motivation to keep learning! 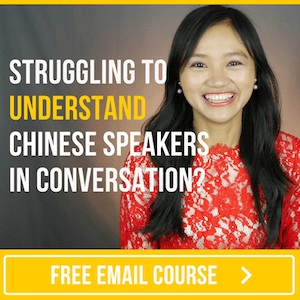 At the end of this post I’ll show you How To Learn Chinese With Songs. But first, allow me to introduce a few tracks to you. zhè shì yī shǒu nán nǚ duì chàng de. shì pān wěi bó hé xián zi duì chàng de gē. gē míng jiào bù dé bù ài. gē cí jiǎng shù le yī duì qíng lǚ zhī jiān de ài qíng gù shì. gē qǔ de jié zòu hěn qīng kuài，ér qiě fù gē de bù fēn hěn róng yì shàng kǒu. xiāng xìn nǐ tīng jǐ cì jiù huì chàng le. This is a male-female duet. It's sung by Pan Weibo & Xianzi. The name of the song is "Bu De Bu Ai". The lyrics are about a love story of a couple. The rythm of the song is very brisk, The chorus is very catchy. I'm sure that you can sing it after listening a couple of times. You can find Pinyin lyrics here & English lyrics here. zhè yě shì yī shǒu nán nǚ duì chàng de gē. shì zhāng zhèn yuè hé cài jiàn yǎ duì chàng de . gē míng jiào sī niàn shì yī zhǒng bìng. kě néng dà jiā yǒu tīng guò zhè shǒu gē. yīn wèi zhè shǒu gē fēi cháng liú xíng. dào chù dōu kě yǐ tīng dào. měi cì dāng wǒ tīng dào zhè shǒu gē de shí hòu，wǒ huì xiǎng qǐ wǒ de chū liàn. This is also a male-female duet. It's sung by Zhang Zhenyue & Cai Jianya. The name of the song is "Si Nian Shi Yi Zhong Bing". Everyone has probably heard this song. Because this song is very popular/famous. You can hear it everywhere. Every time when I hear this song, I think of my first love. You can find the English lyrics here. rú guǒ nǐ xǐ huān R&B de huà，nǐ kě yǐ tīng yī xià táo zhé de pǔ tōng péng yǒu. gē cí jiǎng shù le yī gè nán shēng àn liàn yī gè nǚ shēng de gù shì. tā bù gǎn duì nǚ shēng biǎo bái，nǚ shēng zhǐ bǎ tā dāng zuò shì pǔ tōng péng yǒu. yǒu diǎn xiǎo shāng gǎn. If you like R&B, you can listen to a song called "Pu Tong Peng You" by Taozhe. The lyrics are about a story of a guy who has a crush on a girl. He doesn't dare to confess his love to that girl. The girl just sees him as a ordinary friend. It's a bit sad. qú wǎn tíng de wǒ de gē shēng lǐ. zhè shì yī shǒu shū qíng de màn gē. gāng qín de bàn zòu fēi cháng hǎo tīng. zhè wèi nǚ gē shǒu yǒu yī fù fēi cháng hǎo de sǎng zi. tā bǎ gē qǔ yǎn yì de tè bié hǎo. "Wo De Ge Sheng Li" by Qu Wanting. This is an emotional slow song. The piano accompaniment is very nice. This female singer has a great voice. She performs the song exceptionally well. pǔ shù de píng fán zhī lù. zhè shì yī bù diàn yǐng de zhǔ tí qǔ。gē cí jiǎng shù de， jiù shì wǒ men de rén shēng. zài shēng huó zhōng， wǒ men huì yù dào gè zhǒng gè yàng de wèn tí， yǒu qǐ yǒu luò。wǒ men yào jiān chí zì wǒ， yào guò píng fán de shēng huó. "Ping Fan Zhi Lu" by Pu Shu. This is a theme song of a movie. The lyrics are about our lives. We face all kinds of problems, & ups and downs in life. We need to persevere and adhere to our own identity and live in an ordinary life. You can find the Pinyin lyrics here. If you like Hip-hop or Rap, I recommend you listen to "Quan Bu Dou Shi Ni" by Dragon Pig (feat. Cnballer & Cloud Wang). The lyrics are about a guy who has fallen madly in love with a girl. He wants to travel with this girl. It's sweet and romantic. I think that girl is so lucky! Choose a Chinese song that you really like. Listen to the song a few times without looking at the lyrics. Listen to the song a few times while reading along with the lyrics. Make notes about unknown words (and find out what they mean). Read the Chinese lyrics out loud a few times. Sing along and memorize the lyrics. Create memorable sentences with new words from the song and make use of these in real life.